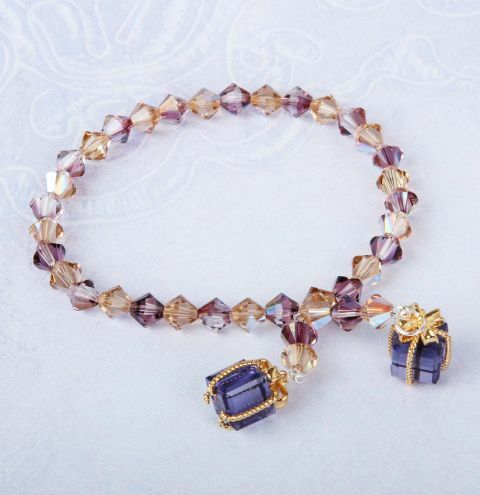 Learn how to make the perfect Christmas bracelet with Swarovski bicones and cute present charms. Cut a 30cm piece of elastic and string on your 16 of each bicone bead, alternating between the colours. Check the bracelet will fit your wrist, before tieing the ends of elastic in a double knot. trim away the ends. You might like to apply a drop of glue to the knot for extra security. Take 2 headpins and thread 3 bicones on one and 2 on the other. Turn a loop at the end of each. Open a jumpring and thread it through both of the loops you just made and close the jumpring between two bicones of your bracelet. Open a jumpring and attach the parcel charm to each end of the eyepins.